Mustang Sally, one of our latest friends on the farm, is a 'rescue' mare from Nevada, US (#1719). She is one of 33 wild horses rescued and adopted to qualifying farms throughout Ontario. The 33 Wild Mustangs many of which were recently rounded up from different herds in the wild and various holding centers throughout the United States were deemed un-adoptable or excess animals. Under a recent law that was passed by the US Congress it slated these horses for eventual disposal in the most economical fashion. Wild Hearts, in cooperation with the BLM - The U.S. Bureau of Land Management, succeeded in a cross boarder transfer originating in Utah and delivered into Ontario, Canada. The word "Mustang" comes from the Spanish word, mesteno, meaning "stray or ownerless" horse. This term describes all wild horses in the United States. Mustangs come in all sizes, shapes, colors and types of build. The average size is 14.2 hands, but can be as short as 13 hands or as tall as 16 hands. The most common colours are sorrel and bay, but any color is possible. 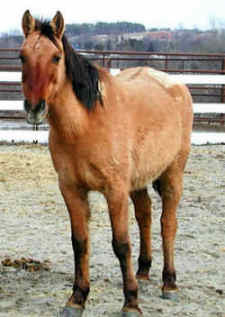 Sally, a buckskin mare is estimated at approximately 14 years old, and she is expected to be in foal. Mustangs evolved over three million years ago and then disappeared from this hemisphere 10,000 years ago. The horse returned to North America when explorers Cortes and DeSoto came from Morocco, Portugal and Spain. The Pueblo Indians learned to ride and passed this skill on to other Indians. In 1680, the Indians revolted against the Spanish rule leaving the Spaniards with thousands of horses running wild. The Spanish-bred horses were herded to the Rio Grande and turned loose over a 200-year period. Interbreeding with draft horses and cowboy ponies that escaped from the ranchers and farmers, their numbers exceeded two million by the year 1900. Ranchers began killing these horses to protect the range-land for their cattle. Fewer than 17,000 horses remained by the year 1970. In 1971, stating that Mustangs were "living symbols of the historic and pioneer spirit of the West," Congress passed the Wild Free-Roaming Horse and Burro Act. Approximately 41,000 Mustangs roam freely today, but few if any have much original Spanish blood.